These Chia Banana Walnut Protein Muffins are the perfect nutritious snack for breakfast, or even after a workout. They're packed with rich flavor, protein and healthy essential Omega-3 fats. This recipe is simple, healthy and delicious with a kick of Cinnamon! Preheat oven to 350 degrees. Grease and line muffin pan. Combine dry ingredients in bowl and break up any lumps. Then whisk wet ingredients in separate bowl until smooth. Add wet ingredients to dry and combine thoroughly. Fold in chopped walnuts and/or sprinkle on top. Using an ice cream scoop, distribute ~2 tablespoons of batter per muffin. Smooth tops with rubber spatula, batter will not rise. Bake for about 20 minutes, until golden brown and cooked through. 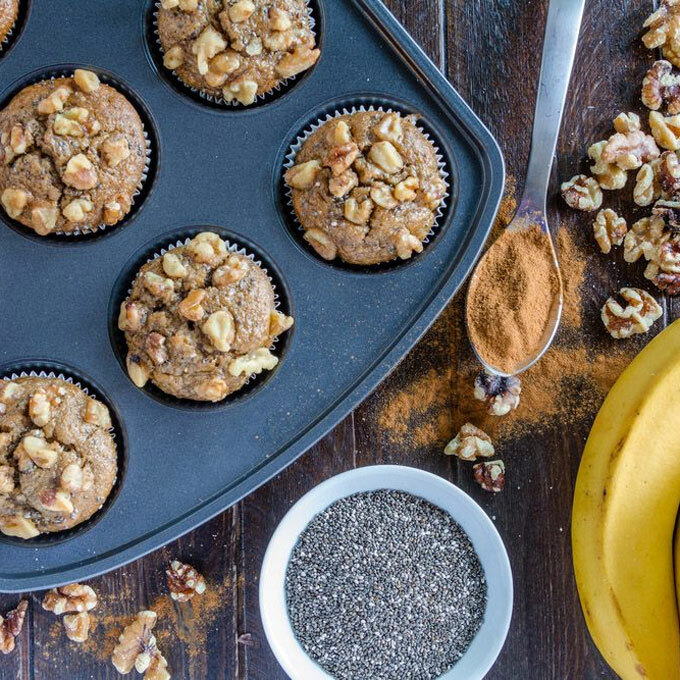 We hope you enjoy these healthy and tasty Chia Banana Walnut Protein Muffins!